Dropping temps and falling snow can mean dangerous things for pregnant women—but fear not: we spoke with an OBGYN for tips on how to stay safe this season. You know all the nuts and bolts of staying safe while pregnant—but true winter is coming (insert Game of Thrones reference here) and that means the rules are about to change a bit. Between icy streets and blasting heat, there's no shortage of danger that comes with the territory of the coldest season and it's important to prepare for the change in weather. 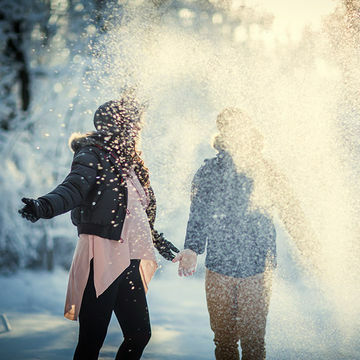 We spoke with Daniel Roshan, M.D., director of maternal-fetal medicine at Rosh in New York City, to pick up a few tips on how women can stay healthy and safe through the season. "With pregnant women, their immune systems are down," Dr. Roshan says. "Sometimes because of the placenta they get hot and cold, hot and cold—they're more prone to develop the flu and that sometimes can cause major problems. Sometimes they get really sick and they need to be intubated." We all love our towering high-heeled boots but for pregnant women, safety comes first. Dr. Roshan suggests sticking to flat, supportive shoes when necessary. The reasons behind this are obvious: You don't want to risk slipping on an icy patch when you're carrying a child. "During pregnancy the balance is affected and they're more prone to slipping or falling," Dr. Roshan says. "Selecting the right shoes is very important." "When it snows too much, sometimes it's better to stay home," Dr. Roshan says. "If they have to commute by subway and go up steps and stuff, it's better to avoid that." It might be a good idea to request the right to work from home when the weather is extreme. We spend much less time out in the sun during the winter—as a result of this, it's important to compensate by consuming enough calcium. "Pregnant women are more prone to osteoporosis, so they should take a calcium supplement and a vitamin D supplement," Dr. Roshan says. It's no secret that when you blast the heat in your apartment, the air gets dry quickly. "I tell pregnant women that if their apartments are too hot or dry they should have a humidifier so they don't end up with nosebleeds. Sometimes opening a window is good to balance the temperature," Dr. Roshan says. "Too much heat can cause dehydration, which can cause the amniotic fluid to go down around the baby," Dr. Roshan says. "In general in pregnancy hydration is more important because it helps to maintain the amniotic fluid." Winter weight gain is all too real—but for a pregnant woman, it can pose health risks. "Maintaining activity and not eating too much is important. The more weight a pregnant woman gains, the bigger the baby gets and then you have more complications. Keeping weight gain to an ideal level is very important. If they're not ambulating as much because of the weather, they can go on a treadmill, a bicycle, an elliptical, or they can swim or go to the gym as long as they don't exhaust themselves," Dr. Roshan says.